Jean-Michel has a line of silk scarves, leggings and now kimonos printed with abstract designs made from his photography. This is his most recent artistic project. He has had exhibitions of his photography as well as published art books. That sounds like a pretty accomplished photographer/designer. What’s intriguing about this though is that it is a part-time pursuit. 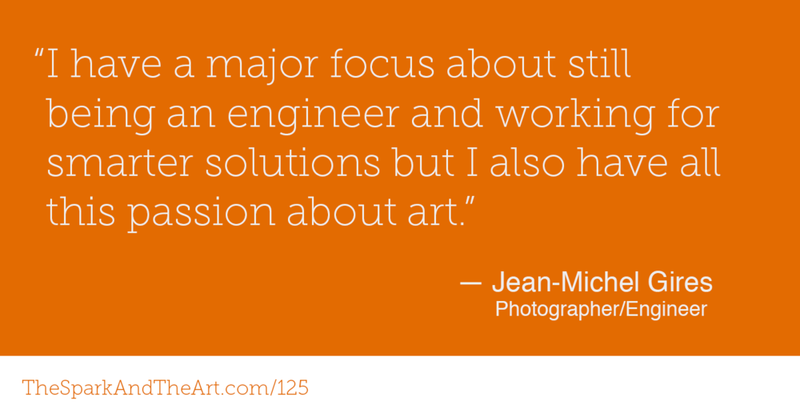 Jean-Michel’s career was actually as an engineer in the oil & gas industry who moved into the CEO position. So how does a CEO from an oil & gas company get into photography? Well, I know because I asked him in our interview. You won’t know because the memory card in my recorder got filled up and we missed about 10 minutes or so of the interview before I noticed and connected the mic directly to the laptop to continue. Of course he said it all in a wonderful Parisian accent and used a much better vocabulary than I just described it all in. So, sorry about that. Also, he’s since left the oil & gas sector and now runs a company focusing on innovation in the energy industry as a whole. He’s seen creativity, art and Innovation from all sides and will tell you very plainly that they are all the same thing. He will also tell you that the world is one big family and full of wonder and beauty. So, ignore the weird gap in the middle because I’m sure you’ll enjoy today's chat with Jean-Michel. Do you know someone who feels trapped in their corporate world? Please share this episode with them it may inspire them to simply start a new creative hobby to express themselves. The easiest way to share is to send the short url TheSparkAndTheArt.com/125 the hardest way is to arrange the gravel in the bottom of your aquarium to spell out the url and hope that your friend sees it when you invite them over to check out how pregnant your guppy has gotten. If you listen in iTunes it would be spectacular if you could give an honest rating and review of the show. It’s a very important thing in iTunes and I’ll never know why but it just helps the show get found by others.